In recent years, the financial and social costs of natural catastrophes in Canada have escalated beyond historical levels. Residential flooding has been a key driver behind this trend, which has led to upward pressure on residential insurance premiums, mental health stress for homeowners impacted by flooding, potential increases in residential mortgage defaults, and lawsuits directed to builders and municipalities that fail in their fiduciary duty to anticipate and mitigate flood risk. Fortunately, a range of practical solutions can be deployed to reduce and limit risk of flooding across a variety of circumstances. These include proactive maintenance of flood control structures, re-grading of lots and roadways, constructing new or upgrading stormwater storage facilities, and many other measures. 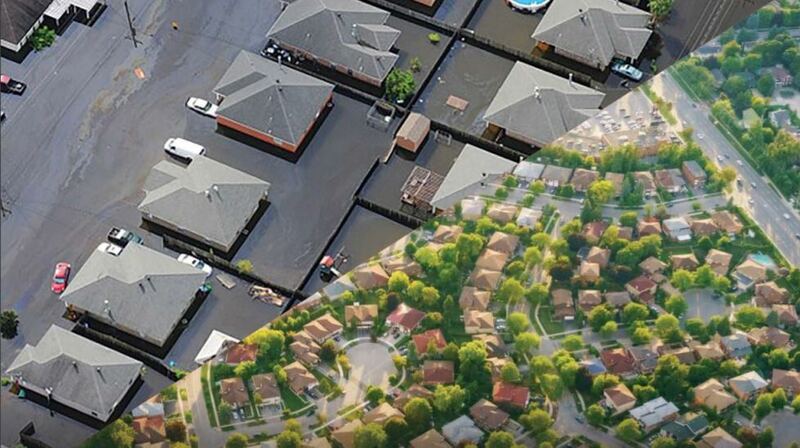 In January of 2019, the Intact Centre on Climate Adaptation at the University of Waterloo (Ontario) published a new report titled “Weathering the Storm: Developing a Canadian Standard for Flood-Resilient Existing Communities.” While Canada-focused, most of its its insights and recommendations apply to communities anywhere in the world. Public engagement and education programs on flood prevention and maintenance activities can also drive the uptake of flood-resilience initiatives in existing communities, particularly for “lower cost” solutions that depend on homeowner participation and support. Presence of critical infrastructure, essential services and social vulnerabilities: each of these criteria would prompt more urgent response to the identified flood-hazard areas. Application of the framework will enable communities to make better-informed decisions when prioritizing areas for flood-resiliency programming. The purpose of the report is to serve as a seed document for a future National Standard of Canada, to be developed based on this framework. Guidance in this report has been well-vetted, as it draws heavily on the insights of municipal planners, engineers, consultants, conservation authorities, developers,homebuilders, insurance industry representatives and stakeholders across Canada. Featured image is from the report. Download full “Weathering The Storm” report (PDF).